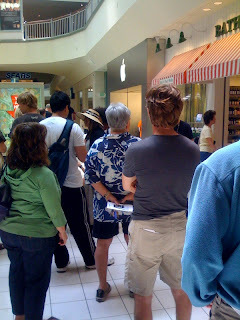 A week after the new iPhone launch, people are still waiting in long lines for the new iPhone. The AT&T store is sold out. The Apple store has a few in stock. We arrived at the Apple store around 12:30 PM. It's about 1:04 PM now. I'm backing up my phone data prior to reset and migration to the new phone.